Follow me on my journey . . .
As I try to discover how the Moffitts were related to my maternal Johnson family. My first brush with this family came when I was reading the minutes from the Johnson reunions. These minutes were kept in a book and ended up in the possession of my grandparents – Glen R. and Vesta (Wilt) Johnson. My grandmother was the secretary of the reunion committee for the last several years that it was held. In the book for the 25th reunion, held on August 23, 1939 under Deaths was this notation: C. C. Moffitt, Knightstown, Ind. Thus began my search for who C.C. Moffitt was in relation to the Johnsons. In the back of the book was a list of addresses. One of the listings was: Mr. C.E. Land, 18 North Franklin St. Knightstown, Ind. Further down was: Mrs. C.C. Moffitt, Knightstown R.R. #2. Stuck in the back of the book was a letter from a Mrs. Helen Land. She talked about not being able to attend one of the reunions. Other items she mentioned alerted me that her mother, who had passed away, had been a Johnson by birth. I started searching on some of the genealogy sites until I ran across a Helen Moffitt who had married a Carlos Land. Helen’s father was Christopher Columbus Moffitt. Mother reportedly Elenora Johnson. Then I found some census records that documented the names. At this moment, the reunion book and letter from Helen Land are in a file cabinet in the back of a room that is full of stuff right now. Once I get my hands on that book and letter, I can go through it line by line to see if I can find some other clues since it’s been a few years since I read it. I’ve yet to find a relationship between Elenora Johnson Moffitt and my Johnson line. Obviously there was a connection, hence the information in the Johnson Reunion minutes, the addresses of those people and a letter from Elenora’s daughter. Elenora was born in July 1859. The information I took this from is an undocumented family tree on Rootsweb. No parents were listed. So where did I go from there? Stay tuned for the second part of my journey – exploring the census records. If you have any information about the Moffitt / Johnson connection or are familiar with the Christopher Columbus Moffitt family – possibly a descendent – please let me know – perhaps we can solve this puzzle together! As I peruse my family file, I’ve come across some of the names listed in the reunion announcement of the first Amore-Werts reunion held on May 25, 1924 at the home of my great-grandparents, (William) Henry and (Mary Angelina) Annie (Werts) Amore. Mr. and Mrs. B.F. Baker – Benjamin and (Louisa) Clementine (called Clemmie) Baker. Clemmie was the daughter of my great-grandparents, my grandfather’s sister. Mr. and Mrs. Donald Baker – Donald Francis and Emma Isabelle (Endsley) Baker. He was the oldest son of Benjamin and Clemmie Baker. Don and Emma’s son with them: Francis Donald. Clarence W. Amore and family – Clarence was the youngest son of my great-grandparents, my grandfather’s brother. His wife (or soon to be ex-wife) was Nellie Buchanan. Children: Theodore William and Harold Winifred. Mr. and Mrs. Foster – Harry and Anna Belle (Baker) Foster. She was the daughter of Benjamin and Clemmie Baker. H. Emmerson – I believe this should actually be Emerson W. and Clara Ethel (Baker) Levering. Clara was the daughter of Benjamin and Clemmie Baker. Mr. and Mrs. Cephas Amore – Cephas and Ada (Prior) Amore. He was the half-brother of my great-grandfather. Children with them included: Ralph C. and Pauline Elizabeth Amore. Mr. and Mrs. John Reese – John Thomas and Laura A. (Amore) Reese. Laura was my great-grandfather’s half-sister. Children with them probably included: Ellis and Edna Reese (possibly also Mary). Mrs. Dennis Brannon – Nellie (Amore) Brannon, wife of William Denison Brannon. She was the youngest half-sister of my great-grandfather. Mrs. William Seater – I believe this should be Gladys Laura (Spragg) Slater (wife of Charles William Slater). Gladys was the niece of Nellie (Amore), Laura (Amore) and Cephas Amore, daughter of Jennie (Amore) Spragg, and half-niece of my great-grandfather. Captain R. Amore – Rollo Amore, 5th child of my great-grandparents, younger brother of my grandfather. Possibly there with his wife, Belle, and children, Beatrice, Florence and Ralph. Rev. I.H. Amore – Isaiah Henderson (Zade) Amore, oldest son (2nd oldest child) of my great-grandparents and older brother of my grandfather. Possibly there with his wife, Lulu, and son, Robert. Miss Marie Buschagen – Marie died around Oct. 23, 2007 as Marie B. Cosier. Her obituary listing doesn’t show any relationship, however, she is listed as there with Rev. I.H. Amore, so she could be a friend, a parishoner, or relative of his wife. Mr. and Mrs. Therman Vensil – George Thurman and Cora Etta (Simon) Vinsel. She was the 2nd cousin of my great-grandmother and daughter of William and Susannah Simon. Mr. and Mrs. Lewis Barcroft – Elizabeth Ann (Werts) and Lewis B. Barcroft. Elizabeth was the first cousin once removed of my great-grandmother. Mrs. William Simmons – Susannah (Werts) Simon. Susannah was also the first cousin once removed of my great-grandmother. Alex Jennings – Alexander Jennings and wife, Sarah Ellen (Simon) (my great-grandmother’s half-sister). Mr. and Mrs. John Jennings – Son of Alexander and Sarah Jennings, half-nephew of my great-grandmother. Mr. and Mrs. Calvin Jennings – Son of Alexander and Sarah Jennings, half-nephew of my great-grandmother. 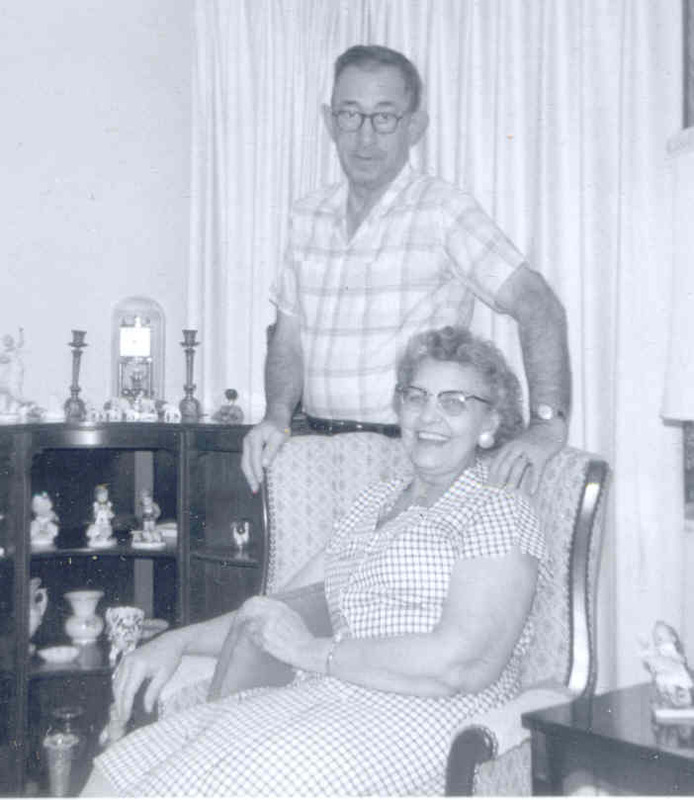 Belford McLain – Belford and Clara Pearl (Jennings) McClain. She was the daughter of my great-grandmother’s half-sister. Delbert Stone – Delbert and Emma Odessa (Jennings) Stone. Emma was the daughter of my great-grandmother’s half-sister. Mr. and Mrs. Calvin Werts – John Calvin and Myra Eudora (Sprague) Werts. Calvin was my great-grandmother’s first cousin once removed. Lloyd Amore – Lloyd and Ella Maria (House) Amore, my grandparents. Roy Amore – son of my great-grandparents, my grandfather’s brother. Mrs. John Shuck – Martha Ellen Adams, granddaughter of John and Elizabeth (Werts) Shroyer. Martha was the 2nd cousin of my great-grandmother. Mrs. Samuel Powelson – Anna M. Powelson, wife of Samuel A. Powelson who was the grandson of Charles and Susannah Maria (Shroyer) Adams. Samuel was the 2nd cousin, once removed of my great-grandmother. 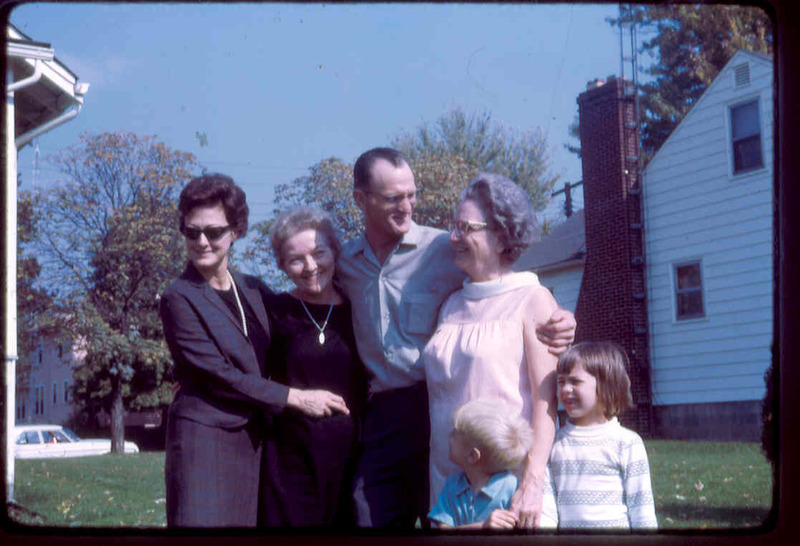 Mr. and Mrs. Walter Shackelford – Walter and Gertrude Pearl (Amore) Shackelford. She was my dad’s oldest sister. Charles Fisher – son of Martha Ellen (Shroyer) Shruck (married names also: Fisher/Wiggins) and George W. Fisher. He was the 2nd cousin, once removed of my great-grandmother. I believe it’s very important to decipher as much as you can from any news clippings that mention ancestors or collateral family members in order to ascertain the relationships. This will also aide in determining the accuracy of the news article. At our first “Cousins” reunion in the summer of 2002, we all spread out in the garage, the kitchen area and the dining area to eat. At the dining table there was a chair placed at the head/corner of the table with an empty place setting. I assumed it was set there in case someone else chose to eat at that table. I asked, “Who’s sitting there?” My cousins told me that was an empty chair in honor of our grandmother, Vesta (Wilt) Johnson. So the empty chair became “Nana’s chair”. On the rare or yearly ocassions that we are together for a pot luck picnic meal, there is an empty chair left at one of the tables. Sometimes there are two – the other in honor of our grandfather, Glen R. Johnson. I am very thankful that I was able to spend over 20 years of my life living close to my maternal grandparents and getting to know them as more than our matriarch and patriarch. There isn’t a gathering where we do not tell stories about them or talk about some of the food that was cooked, who has Granddad’s ears or mannerisms, and how Nana made each one of us feel like we were her only grandchild. They truly were two very special people who shared a great love far and beyond anything those of us who are their descendents could ever imagine or hope for in our own lives. Photo: Glen and Vesta Johnson, 1967. Original in possession of Wendy Littrell (address for private use).